Svartifoss is an incredibly unique waterfalls in South-Iceland. Located in Skaftafell, this waterfall is close to glacier hikes, marks the starting point of Kristinartindar Mountain, camping, and other beautiful waterfalls. 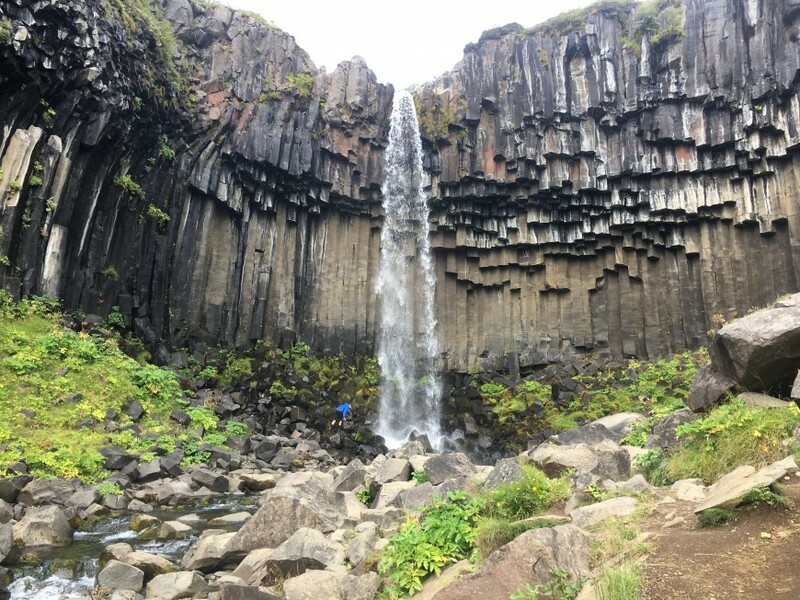 This 20 meter tall fall has water pouring over black columnar basalt, giving it a stunning structure that is so commonly photographed. There are two main ways up to the Svartifoss waterfall. Hikers will park at the visitor’s center, and follow the extremely well marked paths upwards to the falls. It is recommended to take the east path upwards, and the west path downwards. This will allow you to see each of the fantastic falls at various angles. Either path provides hikers with views of the other waterfalls along the way to Svartifoss that are also beautiful attractions by themselves. Once hikers reach Svartifoss, they can cross a bridge over the river, and head down via a great loop, and witness the falls from another angle. Svartifoss is a very popular destination in winter due to the ease of access and beauty. The surrounding glaciers shift in colors from White in the summer, to a deeper blue in winter months. In addition to Svartifoss, hikers will want to see the other attractions and waterfalls along the way. Hundafoss – (Dogs’ Falls) are difficult to see on the east side of the river leading to Svartifoss. It can be clearly seen from the west side of the river. It is beautiful on either side of the river though, just a different angles, and slightly more obstructed form the east side. Magnúsarfoss – You can see Magnúsarfoss waterfall from the east trail on your way to Svartifoss. The better views of this fall are from the west side. .
Þjófafoss – (Thieves’ Falls) Is located just below Hundafoss, which again has better views from the west side trail to Svartifoss. Sjónarsker View-Dial – This viewpoint is located a bit higher and farther than the other falls in the area, requiring hikers to put in a little extra effort. The views from here are extraordinary and 360 degrees. The dial at the viewpoint let’s hikers know what all of the surrounding peaks are. The trails to get to this are shown in the map above. This detour will add less than 2 km to your hike, and is completely worth it.